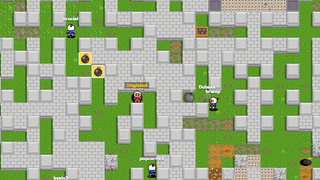 You no longer have to imagine a world in which you can jump into a 1,000 player Bomberman match at any moment, for free, through your browser. Thanks to Bombermine, that world is now a reality. Judging by their sparse Twitter, the Bombermine team launched this addictive MMO game less than 48 hours ago and already the servers are full of eager Bombermen and Bomberwomen. While Bombermine does deliver the classic Bomberman gameplay you know and love on a massive scale, it actually has even more to offer. This thing is surprisingly deep, with numerous power-ups, secrets, a squad-formation feature, and of course sweet sweet bombs. Each match lasts 20 minutes, but all the different features keep the game exciting. Heck you might even turn into a Pokémon. Or Kenny from South Park. Or get chased by a Pac-Man with dentures. You'll see. You can play it right here.